On February 24, 1959, at 8:20 PM EST, Pilot Killian reported seeing three bright lights off his port wing during a routine flight from Newark to Detroit. The lights were first seen approximately 13 miles west of Williamsport, PA. The lights were at an angle of elevation of roughly 15 degrees above the plane. The plane was flying at 8500 feet and at a heading of 295 degrees. During the next 45 minutes the lights moved slowly ahead of the DC-6 and then returned to off the port wing. The lights changed intensity becoming “brighter than any star” and then fading away to the point they could not be seen. Colors varied between yellow-orange to blue-white. The rear most light tended to move back and forth relative to the other two lights. Captain Yates, aboard United Airlines flight 321, had seen the objects from 8:40 PM to 9:10 PM between Lockhaven, PA and Youngstown, Ohio. In the vicinity of Warren, Ohio, the objects no longer paced his aircraft and then accelerated toward the northwest. A plane over Lake Erie reported seeing the objects to the south over Cleveland. A plane near Sandusky, Ohio, headed towards Pittsburgh, reported seeing the objects to the southeast. Observers in Akron, Ohio reported seeing the objects heading west around 9:25 PM. These are the details of the case as presented by NICAP. Blue Book’s investigation revealed some more details that would eventually list the case as explained. had seen the stars through broken cloud cover and filed a report similar to those filed by the pilots on the evening of the 24th. It is important to note that at no time did the USAF officer state that all sightings were made by drunks or that Killian had been drunk. They were addressing UFO reports as a whole and probably was made based on experience they had on a few occasions, where the witnesses might have not been completely sober. I am sure modern UFO hot lines have had similar experiences. 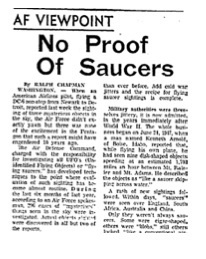 Despite the obvious context of the statement, some UFO proponents still tried to imply that the AF thought Killian was drinking. The Detroit times had contacted the USAF on 25 February asking for a comment.7 This resulted in Blue Book calling American airlines on the telephone requesting a statement from Captain Killian. According to hand written notes, the USAF reports that American Airlines had yet to receive a report and that the newspapers had “blown up” what he had stated over the phone.8 On March 4th, American airlines sent a letter to Blue Book with a statement made by Killian, which was received on March 9th. The only possible explanation other than flying saucers could be a jet tanker refueling operation. Never having witnessed refueling operations at night, I am not aware of the lighting of the jet tanker. I contacted ATC to find out if they had any airplanes on a clearance and no three airplanes were given. In summary, it was difficult for me to believe they were jets because of low speed and configuration. The tower operators on duty at the time of the sighting reported that the three lights were observed. An immediate check with the 772nd ACW squadron Claysburg, PA, disclosed there were three B-47s in the area at the time on a night refueling mission. The tower operators made no report due to the fact there was nothing unusual to report. Furthermore, no statements were made to the newspapers. By the 11th of March, Blue Book had begun to come to the conclusion that the lights were from a refueling operation involving three B-47s. On March 6, a letter was mailed by the UFO research committee, in Akron, requesting the USAF elaborate on their belt of orion explanation. The 26th Air Division, which was responsible for the region, read about the case in the newspapers but never received any formal report from Blue Book.14 They sent out a memo on 8 April, pointing out to Blue Book should send them a copy of the report for their records. The memo implied that the 26th Air Division command was not too happy about the way Blue Book was doing business. On 27 July, Major Friend’s UFO advisory panel met and discussed recent UFO cases.15 The Killian case was mentioned and the panel, which included Dr. Hynek, agreed that the refueling exercise explanation was probably correct. However, they felt the investigation was inadequate and requested that Captain Killian, and his co-pilot, be interviewed for the record. On July 30th, Blue Book sent a message to Mitchell AFB requesting they contact Captain Killian and his co-pilot and obtain any addi- tional information. Mitchell AFB sent a representative to interview Captain Killian. Rather than have Killian write another statement, the interviewer simply asked for additional details. According to Killian, he was flying a direct route from Newark to Detroit. He had sighted the lights at 2045 when he was halfway between the Williamsport OMNI and the Bradford Omni.16 He also added he was flying along the Victor 116 airway. The rest of the information mirrored what had been stated previously. One must remember that this was 1959. Because there was no Freedom of Information Act in 1959, the memos, letters, and documents would have been written based on a belief that they could speak honestly about their findings and not worry about individuals outside the USAF second guessing them. They also never expected anybody to conduct a peer review of their conclusions. Blue Book accepted the fact that the radar squadron tracked the B-47s and they apparently felt no need to obtain any more information. Hynek also pointed out that the low rank of the Blue Book head made it difficult to obtain information from other commands. De- pending on the commander, obtaining pertinent information about operations was sometimes difficult. Requests may or may not be answered. Statement from 772nd ACW Squadron confirming they tracked the B-47s that night. A transcript of any recordings between the pilots and the Air Traffic Controllers. Aerial charts showing the aircraft locations and direction of observation that would demonstrate they were observing a refu- eling operation. These should have been collected but one has to keep in mind what Hynek stated about Major Friend’s limited abilities in acquiring such details. In some instances there may have been phone calls to these organizations but they received no response. We don’t know for sure. The 26th air command’s nasty memo demanding the report for their records was indicative of how Blue Book seemed to be “out on their own”. Apparently, the 26th felt, and rightfully so, they should have been involved in resolving the case. It is important to note that the command did NOT state there were no B-47s present or that refueling operations did NOT occur in Pennsylvania. They just demanded a copy of the report for their records. If it weren’t for the report from the 2253rd base group stating that the lights were seen by tower operators in Pittsburgh and that the 772nd ACW squadron had confirmed they were B-47s on a refueling operation, it would be hard to accept the refueling operation explanation. Since there is no reason to question the report, it appears that the operation is confirmed. 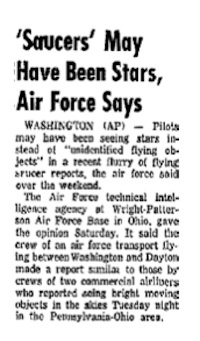 While the B-47 refueling operation appears reasonable for this sighting, UFO groups and proponents still appear to reject the explanation for various reasons. In an effort to examine the case completely, I chose to address a summary of the arguments I have compiled from various sources. It is possible that the KC-97 was not visible or that the information was incorrect. There may have been only two B-47s and a KC-97. This, by itself, does not falsify the refueling exercise explanation. It seems that the knowledge of the refueling operation was not readily available for some reason. The tower personnel at Pittsburgh knew nothing of the refueling operation until they took the effort to check with the local radar squadron. It is possible that the pi- lots only asked if there was any aircraft in the area and the Air Traffic Controllers only checked to see for scheduled aircraft. We don’t know how the refueling operation was conveyed. Knowing the standard procedure used by the USAF today, the notification to the FAA probably just stated the area was going to be used for refueling operations between a certain time frame. In order to determine if there were aircraft using that area at the time, they would need radar information, which is exactly what the tower operators at Pittsburgh did to identify the lights. Examining the Blue Book files reveals that there was a sighting by a KC-97, involved in a refueling operation, near Parkersburg, West Virginia on October 9 1957. Parkersburg is about one hundred miles southwest of Pittsburgh. Even though the tanker was flying towards the southwest, it indicates that there were refueling areas in the region during the late 1950s. 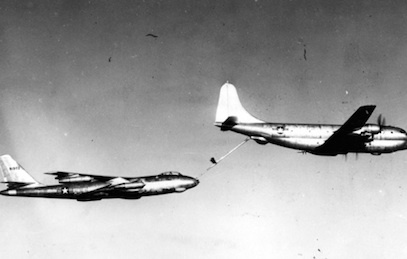 The initial phase of the refueling operation has the B-47s coming up to the KC-97. The B-47s could have been flying at a higher speed before meeting up with the tanker. Once they had done so, they slowed down. This explains the lights moving ahead of Killian and then, slowly drifting back. This is true that there was never a record produced but the ACW squadron’s report appears to be adequate to confirm that B-47s were in the area. Either this report was a lie or Blue Book figured this was enough and never bothered to purse getting an actual paper report. Killian had stated he was in the vicinity of Bradford, PA, when he saw the lights. The letter from Major General Fisher appears to have confused the location for Killian’s plane with the refueling aircraft. This is a valid argument but one has to wonder about this estimate. According to the earliest UPI story, Killian stated, “...the lights were not close to the plane, but appeared in the southern sky, a little higher than his plane, which was flying at about 8,500 feet.” 25 An elevation of 30 degrees is not “a little higher than the plane”. If the elevation angle was 30 degrees, I suspect the co-pilot never could have seen the lights from his seat. The reference to the lights being only a little higher than the plane indicates it was only a few degrees above the plane’s elevation. This puts the lights at distances of about 30 miles or greater. While the refueling operation explanation is not as solid as I would like it, there is no good reason to reject it. If one is going to reject the explanation, they have to assume that the tower operators at Pittsburgh/radar operators at Claysburg were lying or there was a refueling operation and UFOs present that night. In either case, one would also have to assume that all Blue Book personnel, including Hynek and Friend, were involved in a conspiracy to cover-up the information. While some might consider this plausible, I tend to think it is highly unlikely. Both Friend and Hynek would have revealed that they were involved in such a conspir- acy long ago. Based on the available information, I would not consider this case to be “best evidence” and it should be removed from that list.